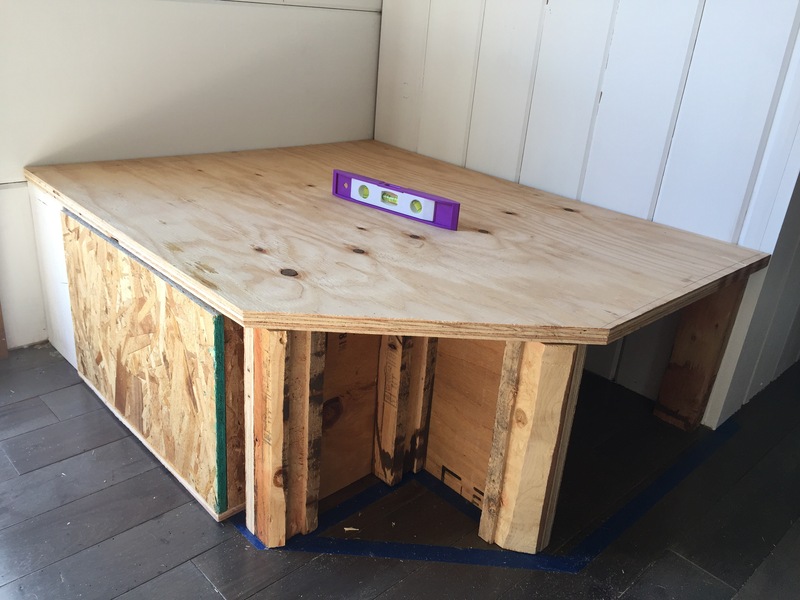 Step 1: Build a functional platform for my wood stove to rest on. 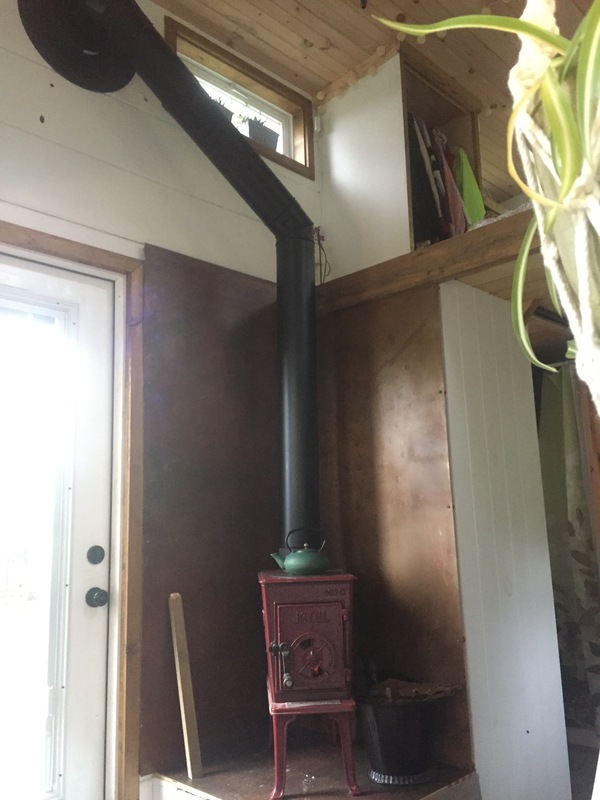 Every inch of space in a tiny matters, so I decided to set my wood stove on a platform in order to at least utilize the space under it. There is a section for shoes and a drawer where I keep a stash of wood so I don’t have to go outside at night. 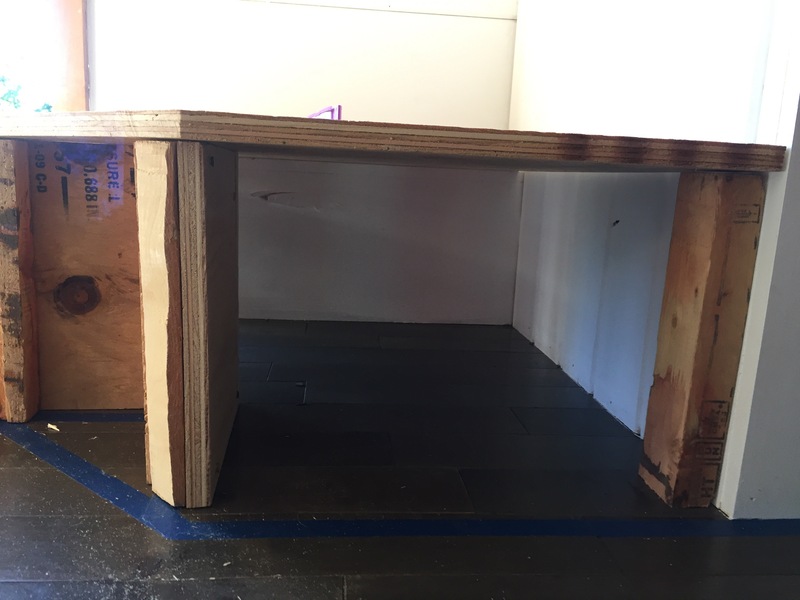 To safely have the wood stove in such a small space, I had to cover the walls with non-combustible material. I chose to use steel, but didn’t love the idea of shiny silver lining my walls. Instead, I got steel and Sof (my super-awesome-project-side-kick) helped me patina it so that it looks artsy and rustic! It turned out great! 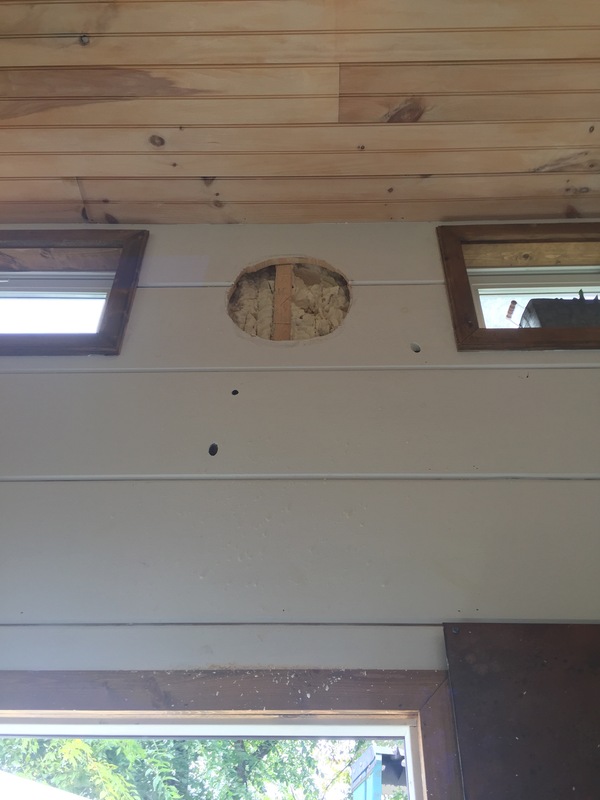 Then it was just a matter of screwing it into the wall with spacers so there is air flow behind it to protect the wall from the heat. 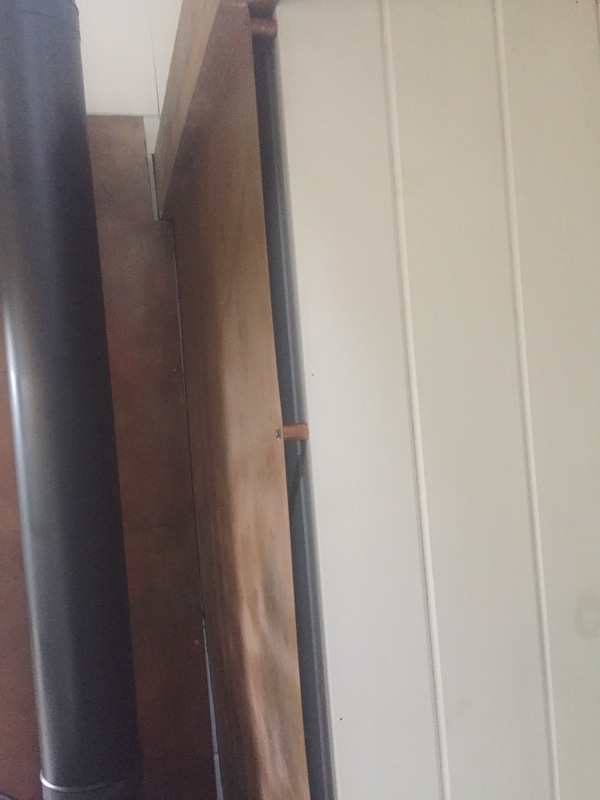 The screws just go through the copper pipe couplings attaching the sheet metal to the wall behind it, with a uniform 1-inch space between the metal and the wall. Step 3: Plan the chimney path and buy the things. This one really held me up, for some reason I just couldn’t figure out where to start. 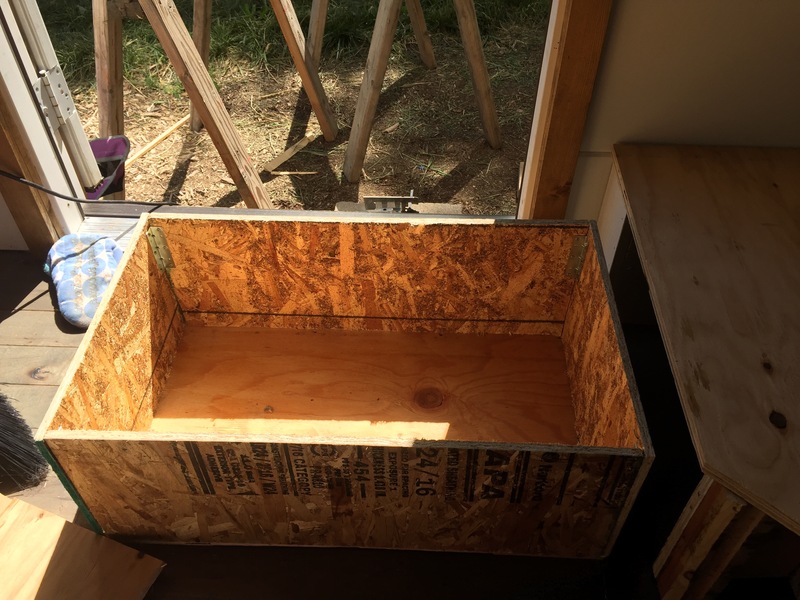 With Sof’s help, I finally sketched my idea, took some measurements, and headed to a very specific Ace Hardware store that specializes in wood stoves. Charlie, at Poulsen Ace, really knew his stuff and was extremely helpful. Full disclosure: If you’re planning to install a wood stove, prepare to spend just as much (or more) on the stove pipes and chimney pipes as you do on the stove itself. 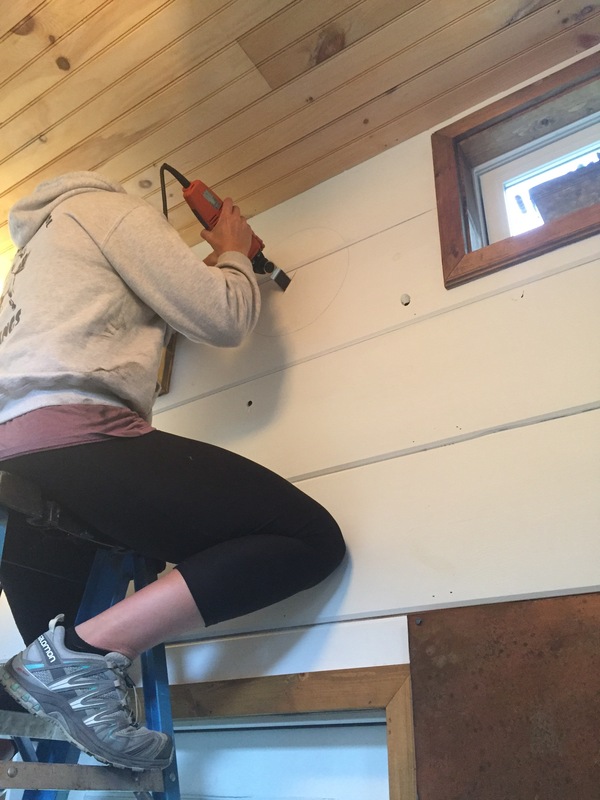 Step 4: Round up a friend or two and cut a hole in your house. This is once the wall thimble is in place, but you’re looking at my front yard through the inside of my house right here! * If you’re lucky like me, your friends will be there for moral support…but still make you cut the hole yourself. Step 5: Install the stove pipe. Stove pipe is single-wall steel pipe, painted black for aesthetics (it comes this way, don’t paint it yourself without heat-safe paint!). My stove requires 6″ diameter pipe, so that’s what I used. It meets a 12″ long piece of triple-wall chimney pipe (aka class A pipe) just before it goes through the wall thimble. The wall thimble seals up the hole you just cut in your wall and allows the chimney to pass through safely. Triple-wall pipe is insulated, just like it sounds, with three walls so the outside of it isn’t hot to the touch. 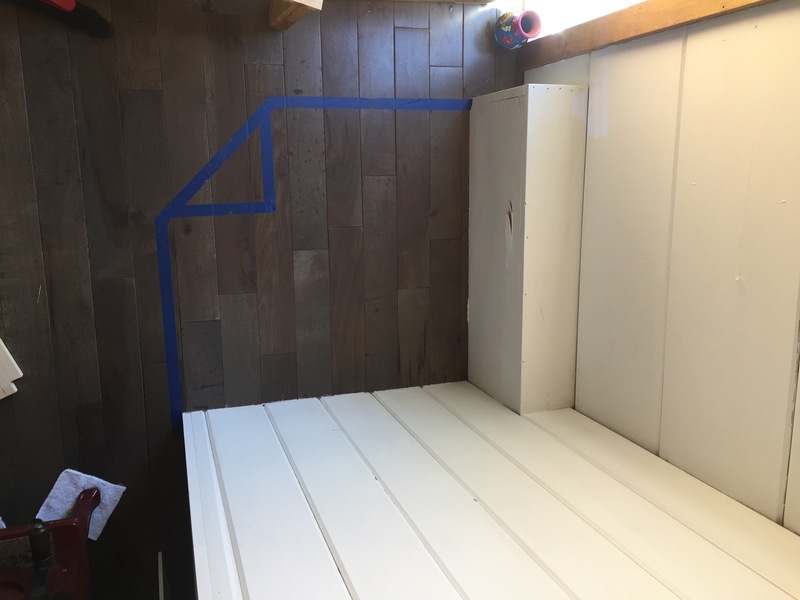 The class A section that goes through the wall meets a T pipe on the outside (which allows for chimney cleaning) and then goes up above the roof where it’s capped off so nothing gets into the chimney (rain, rodents, etc). Step 6: Enjoy your cozy new addition! I decided to have the chimney on the inside of my house for as long as possible because the single-wall allows heat to escape. Essentially, the more stove pipe you have inside, the more heat your wood stove provides. Also, I had to go through the wall rather than the roof because the roof is lined with solar panels.